I knew a friend of mine was working on a book, so I was excited for him when he told me it had finally been published! I immediately bought myself a copy, but then I started to worry, as I think is normal whenever a friend asks you to read something he or she wrote. What if it's not good? What would I say? I didn't need to worry. Michael Marini's memoir about his family, Seven: In the Lane of Hope, is warm, inspiring, and funny. The memoir begins on Christmas Day 2011, when Michael's 77-year old father was in the hospital, and doctors said he was dying. His entire family - Michael, his 10 siblings, and his mother - gathered around his sickbed, but his father wasn't ready to die yet. He made a miraculous recovery, slowly but surely, which caused Michael to think more deeply about his family and his faith. They ran a produce business in the summer and a Christmas tree business in the holiday season, and the whole family pitched in to help. Much of the book focuses on Michael's seven sisters (hence the title), with a chapter devoted to each one, the role they played during his father's infirmary, and their roles in the family. Along the way, Michael shares stories of his own life growing up, for a long time the youngest of ten kids, as a part of this big, loving family. There were many moments of joy but also plenty of challenges, like his father's illness. All of the kids were runners, on the track and/or cross-country teams for their schools (as Michael points out, what better sport for a family of 10 kids, where the only equipment needed is sneakers? ), so many of his stories deal with running. The memoir is book-ended by the story of his father's recovery. I relaxed as I began to read the memoir and realized that not only was Michael a good writer, but his sense of humor came through in his writing. His stories of his sisters and the rest of his family are warm, affectionate, and often very funny, especially from his perspective as the youngest for the first seven years of his life. Running and racing are themes throughout the memoir, both literally and as a metaphor for life. His father, who coached all of them and was a runner himself, had all kinds of insightful sayings that Michael shares, including some that really spoke to me, like "You are right where you need to be." There is also a thread of religion throughout the book. Though I consider myself spiritual, I am not very religious, but although faith is an important part of Michael's family's lives, I did not find these elements to be overly obtrusive - they are there if you want them. There is plenty to relate to in this book and find inspiration from, even if you are more of a secular person as I am. In fact, I thoroughly enjoyed this insightful and witty story of a remarkable, loving family, and I dog-eared many, many pages with inspirational words I want to add to my Quote Journal. 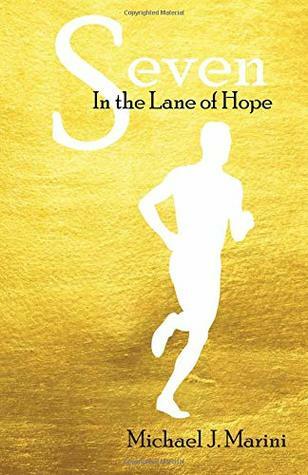 Seven: In the Lane of Hope is available through Amazon, both as an e-book and in print. This book sounds really good and I think I'd enjoy it. I think you would, Vicki! What a relief that you enjoyed it as there is always a moment of panic that we won't like something written by friend or family. His family sounds lovely.